Neuroecomonics—the combination of economics, neuroscience, and psychology employed to determine how individuals make economic decisions—is the rage these days. This kind of study originally began in the lab scrutinizing gambling strategies and was thus limited by artificial constraints. The claim the authors make is that they have moved the science out of the lab and into the wide world, into large-scale field experiments that look at people in naturally occurring environments. “In the wild” is how they term it. This burden the authors do not meet, which is not to say that their book isn’t without merit. Their core question is, “What motivates people, and why?” The fact that they never quite find out isn’t a fatal flaw, because along the way we get to see the enormous complexity and counterintuitive forces that shape a given person’s decisions and desires. They question things such as expensive, faddish education programs and ask point blank whether they make any difference at all (the answer is no). 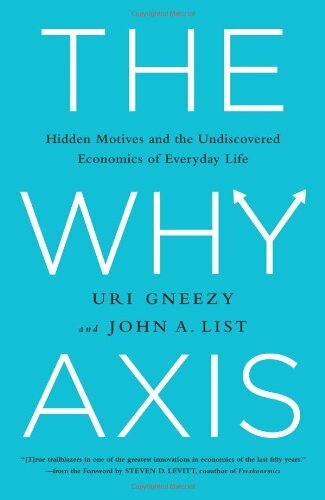 The authors seek to understand “what kinds of incentives” cause individuals to do the socially altruistic thing. For instance, when it comes to environmentally green behavior people respond to peer pressure—being told that other hotel guests choose to reuse their towels—much more readily than they do to direct appeals for environmental stewardship. Their overall aim is to determine what people really value. Once the answer is in hand they can presumably predict why people want what they want and behave in the otherwise inexplicable ways that they do. No one could argue with that point of view. Richard E. Cytowic, a Professor of Neurology at George Washington University, writes “The Fallible Mind” blog at Psychology Today. His latest book on synesthesia, Wednesday Is Indigo Blue, won the Montaigne Medal. Follow him @Cytowic or on YouTube.